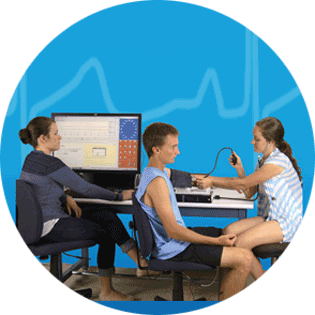 With the Biopac Student Lab Exercise Physiology and Biomechanics System it’s simple to combine a wide range of respiratory, cardiovascular, muscular, and/or pulmonary function signals with biomechanical data. Students can perform intuitive guided physiology lessons or create their own experimental designs for advanced research. The system also easily interfaces with force plates, motion analysis equipment, and other third-party instrumentation. With over five million successful lab hours in classrooms around the world, the Biopac Student Lab (BSL) offers the most meaningful, flexible lab experience for both students and instructors. BIOPAC systems provide a complete solution with hardware, software, and curriculum for higher education life science applications. Suitable for inquiry-based, active learning in 2-yr. and 4-yr. programs, medical schools, and nursing programs. 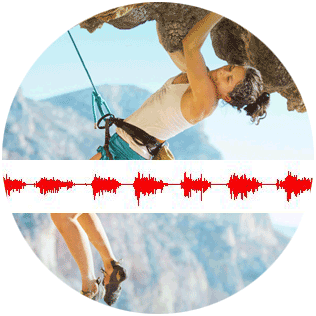 Powerful setup and analysis tools make the BSL ideal for graduate studies and personal research. Searchable PDF Manuals and Tutorials (BSL PRO, Instructor’s Guide, Answer Key, etc. Perform 27 or more lessons with this core package! 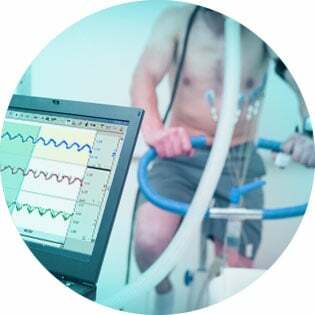 Increase your exercise physiology lab options with the GASSYS2-EA Gas Analysis System and accessories to record and analyze expired O2 and CO2 levels. See the Exercise Physiology TA Pack for additional information on system add-ons—this specially designed package includes some of the most popular exercise physiology system additions including the Multi-Lead ECG Cable, Cardiac Output Sensor, package of Disposable Bioimpedance Strip Electrodes, and Gas Analysis System. 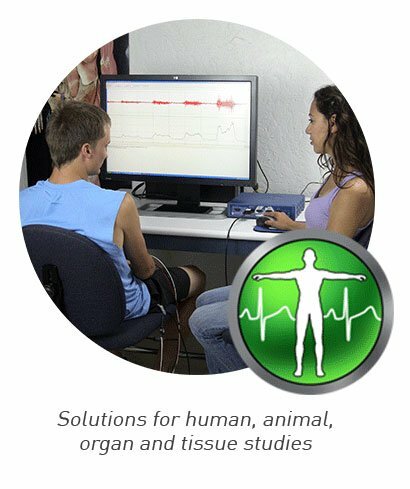 BIOPAC also offers transducers for gait analysis, range of motion/goniometry, acceleration, and bioimpedance/cardiac output, for advanced exercise physiology and biomechanics applications. 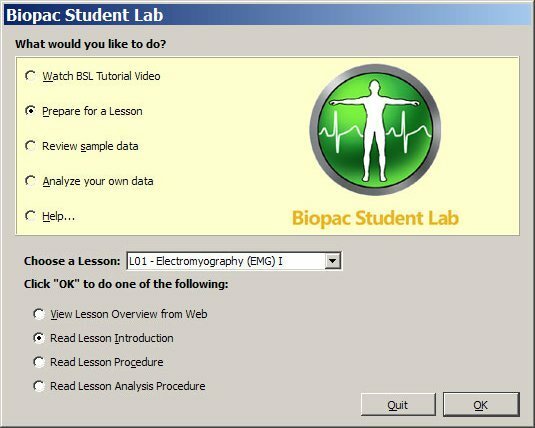 The Biopac Student Lab system is an integrated solution that allows students to record data from their own bodies, animals, or tissue preparations. Easy to use yet powerful enough for advanced research applications, the Biopac Student Lab revolutionizes how students learn by eliminating complex setup tasks and letting them focus on learning the subject. Free Student Download – Students can use this free BSL software to prepare for class by reading lessons or watching videos, and can also analyze, share, and submit data. 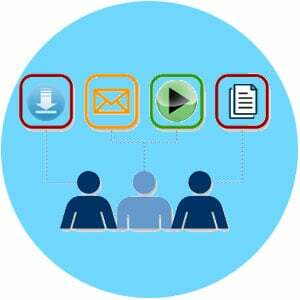 Biopac Student Lab software—Powerful and flexible, yet easy to use, BSL 4 software allows students to get started right away. To run a lesson, simply select it from a menu. 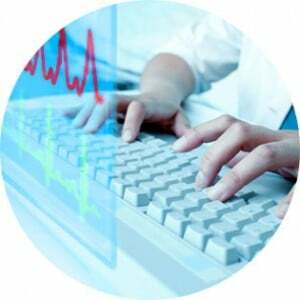 With easy software and hardware setup, students can focus on scientific principles, not procedure. BSL is provided in English and French; Translations of BSL 3.7.3 for Windows are available in Chinese (Traditional), Italian, Japanese, Russian, and Spanish. The Biopac Student Lab system, BSL 4 greatly improves the lab experience with a dynamic user interface and enhanced capabilities. Curriculum—Guided lessons feature on-screen instructions, video demonstrations, and sample data to ensure students record high-quality data. Teacher’s Guide includes sample questions and answers, normative values, and support tools. Hardware—The heart of every Biopac Student Lab system is the data acquisition unit, which converts incoming signals into digital signals that can be processed by a computer. MP36/35 units have four input channels and the MP45 unit has two input channels. Electrodes, transducers, and/or input/output devices connect to the MP data acquisition unit so students can record data from their own heart signals (ECG), brain waves (EEG), muscle activity (EMG), eye movement (EOG), and more—or from animal or tissue preps. Thousands of undergraduate labs worldwide use the Biopac Student Lab to teach physiology, pharmacology, biology, neuroscience, psychology, exercise physiology, and biomechanical engineering. Click here for the BSL User List.